It's pretty hard to hold a stock forever. Here are three that some of our top writers say they plan to hold for the long haul. With the stock market having lost 10% of its value since late May, a lot of investors out there are probably pondering selling right now, fearing an even bigger drop to come. However, for investors still many years away from actually needing the proceeds of their investments, chances are holding tight is the better long-term decision. With selling on so many people's minds right now, we asked three of our regular contributors to tell us about a stock that they would never sell. Our contributors gave us Cummins (NYSE:CMI), The Boeing Company (NYSE:BA), and growth superstar SolarCity (NASDAQ:SCTY.DL) -- three companies that all share great leadership, dominant industry positions, and strong competitive advantages. Let's take a closer look at these three stocks and why our contributors called them "never sell" companies. Neha Chamaria: I'd look for four qualities in a "buy and hold forever" company: timeless product, innovative leadership, competitive advantage, and strong fundamentals. Cummins measures up. As a global leader in the design and manufacture of diesel engines and related technologies like fuel systems, emission solutions, and filtration, Cummins enjoys a solid competitive advantage in its industry. Aside from trucks and buses, Cummins engines are found in nearly every off-highway market including construction, agriculture, rail, mining, marine, oil and gas, and power generation. Cummins engines have made their way into 190 countries today. That's not all. Cummins has a solid presence in the natural gas-engine market through its long-standing partnership with Westport Innovations, which makes it one of the biggest potential beneficiaries as the adoption of the alternative fuel gathers steam. CMI Revenue (TTM) data by YCharts. Thanks to the company's solid growth in its top and bottom lines and free cash flows over the years, shareholders have been richly rewarded. Cummins' quarterly dividend has grown more than five times since 2010, and it has committed to returning 50% of operating cash to shareholders in the form of dividends and share repurchases through 2018. Cummins has been the front-runner in bringing technologically advanced and cleaner engines into the market. It should continue to lead the pack as more countries push for stricter emission regulations in the coming years. 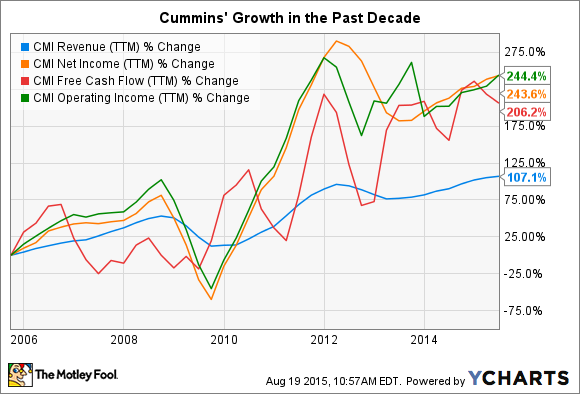 A solid long-term growth story in the making, Cummins is a stock worth holding forever. Rich Smith: "50," so people tell me, is the new "30." So if I say I'd "never" sell a stock, what I probably mean is that I'd be very comfortable holding it for "a long time." Priced just shy of $133 per share and at a price-to-earnings ratio of more than 17.6, Boeing shares are not exactly cheap today. Analysts polled by S&P Capital IQ think the stock's not likely to grow earnings much faster than 11% annually over the next five years. That, combined with a 2.7% dividend yield, gives the stock a "total return" of less than 14% -- which as a value investor, I consider suboptimal for a 17.6 P/E stock. All that said, what I think many investors (analysts included) may not be realizing is that Boeing won a huge victory over its labor union in the last round of negotiations with the International Association of Machinists and Aerospace Workers local in Seattle. In exchange for promising to keep Boeing 777X production work in Washington state, the company secured a contract that will restrict a large chunk of Boeing's work to pay raises of no more than about a half a percentage point a year from 2016 through 2024. Those are pretty tight cost controls. When you add to them the fact that Boeing need not worry about labor strikes for nearly a decade and that management will not suffer the distraction of acrimonious labor negotiations for a similar term, I think Boeing's admirably placed to outperform estimates and grow earnings (and dividends) for nearly 10 straight years. To me, that seems like a good reason to hold Boeing stock for a good long time to come. Jason Hall: Am I nuts to call a highly shorted growth stock -- and a company that's yet to report a profit -- a "never sell" investment? Maybe. But let me explain why before you dismiss it out of hand. SolarCity rings all three of these bells. The three founders -- CEO Lyndon Rive, CTO Peter Rive, and Chairman Elon Musk -- own 26% of the company's shares. Not only does this mean they all have a significant stake in its success, but it will make it much harder for outsiders to influence the company. As to opportunity and leadership position, there are more than 90 million single-family homes in the U.S., and SolarCity only has 260,000 customers. Even as small as that is relative to its potential market, SolarCity is dominant. Through the first quarter (most recent data), SolarCity was as large as its 34 largest competitors combined. Lastly, the company is built -- and is building -- for the long term. SolarCity will add about $6 billion in long-term contracted payments this year and probably $9 billion in 2016. By the time it gets to 1 million customers, it could easily have $30 billion in long-term cash flows under contract, and at very low costs to maintain and bill those customers. That's the kind of business I'll never want to sell, and unless things go very wrong, I never, ever will.